I had a difference of opinion with a member of my supergroup concerning the Invisible Woman. He argued that she plays like a weaker version of Cyclops with more support skills, and is further disappointing because she spends less time in stealth than other stealthy characters. These points may be true, in particular at high level content, but I'm having a lot of fun playing her anyway. Part of the comparison to Cyclops is that Invisible Woman has a basic attack power that ricochets. 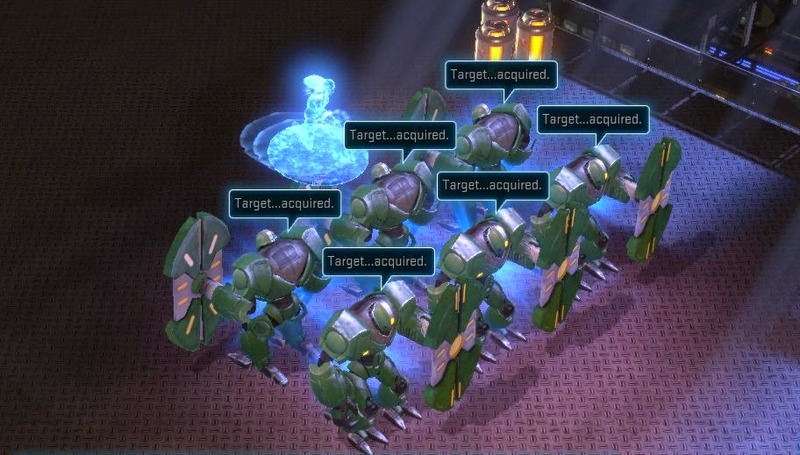 This means you can spam the attack infinitely and it will bounce automatically between a large hostile and inanimate targets. The damage isn't super high - similar powers that cost spirit to use, such as Captain America's shield toss or Nightcrawler's self-teleporting-projectile Blink Strike, do more damage, but the convenience can't be beat. 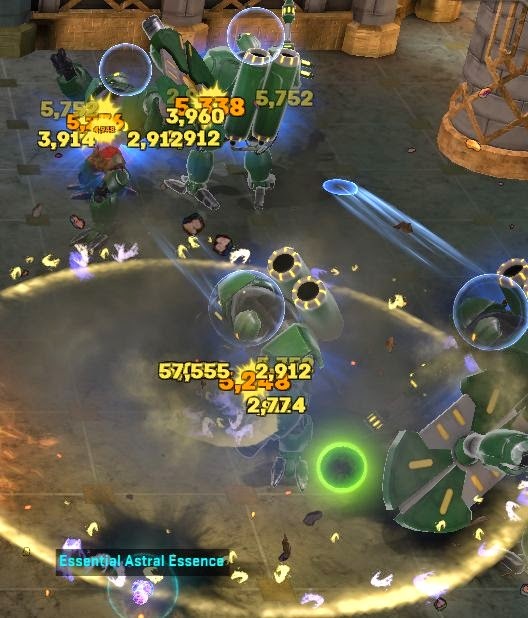 Invisible Woman also has some of my other favorite abilities that are commonly found on other characters, including a ground targeted damage over time effect (mob AI is not any better than MMO players at getting out of the fire) and a swarm of auto-targeting force spheres. Collectively, she can clear out a room of trash very quickly. Which gets us back to the other point about stealth/invisibility or lack thereof. The bad news is that my colleague is technically accurate that Invisible Woman starts combat from stealth (she is automatically and permanently invisible any time she is out of combat) but once she is fighting she typically does ranged combat like other non-stealthy characters. She can escape into stealth by kiting for a few seconds, but other characters can get out at the click of a spammable button that's also part of their DPS rotation. But ironically the good news is that you never need to fight any trash if you don't feel like doing so. Mobs will emote because the AI doesn't know to turn that off just because because the mob can't see you, but you can easily, effortlessly and painlessly skip everything you don't feel like fighting. This is also true for characters who can teleport, and to a lesser extent to any hero willing to repeatedly dodge-roll for their life across the entire map, but this is a ton more work. Maybe the appeal for me is that she's the ideal character if you're too lazy to work at avoiding and/or targeting the enemy? At the end of the day, it is not in the developer's interest for any of the characters to be bad, as they're making money selling all of them. Novelty characters are possible, but probably limited (and I don't know that anyone would have picked Sue Storm for this). Maybe this particular character is under-tuned (in fairness, her DPS does seem slightly low), but should the fun factor count for something? 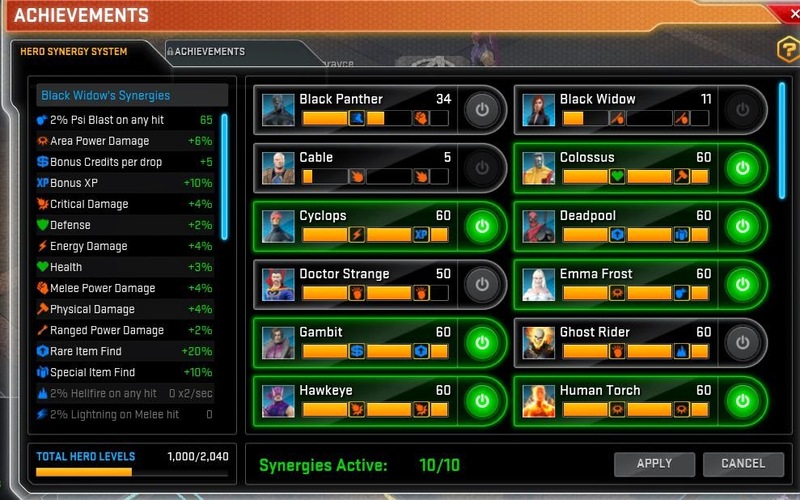 I hit a milestone in Marvel Heroes over the long weekend, gaining my 1000th combined level. The levels are split between 26 different heroes, some of whom are relatively low level, in particular characters who are awaiting their post-launch reworks. Overall it's 10 characters at level 60, 5 more inactive characters parked at level 50 or 52, and then a small handful of characters I actually consider active. There are a total of 2040 levels in game amongst the 34 released heroes, with a new 60-level hero added every month, so I'm not even half way to the total cap (especially since the higher levels go slower than the low levels do). 16 of the common 50% exp boosts (32 hours total, I would "store" these by consuming all of them - which I've done with the 50% rare item find boosts - except that sometimes I want it to expire). The overwhelming majority of these come from quest rewards - three per character. All told, I can get above 350% bonus exp with a couple of mouse clicks and stay at that level for at least twelve hours /played before stuff starts falling off, and all of that is multiplicative with any server bonuses. Thus the reduced enthusiasm for server exp events. Then again, it does seem like the events are so frequent and so impactful that it's almost anticlimactic to play when there is NOT an event available. So that's where I am going into the game's touted 1st birthday. I'd say expectations - speculation runs anywhere from free G's for the cash shop to a surprise hero - are unrealistically high, but they have done a pretty impressive job with past events. Guess we'll know in a bit over a week. If you've used player auction houses in an MMO, chances are you have experienced significant pricing errors from both sides of the equation - as the player who screwed up and listed an item for a fraction of its value, and as the person fortunate enough to grab a major windfall as a result. As interactions between cash shops and tradeable currency/items increase, the stakes feel somewhat higher. I snagged an item I've been camping on Neverwinter's auction house that typically sells for around $30 worth of Astral Diamonds for a mere $1 worth of AD. This was almost certainly a pricing error on the part of the seller - opening the lock boxes that the item drops from requires a key that costs $1.50 worth of AD so it's pretty unlikely that anyone would sell any of the good prizes for less than the cost of a single key. I haven't equipped the thing yet. I've done nothing wrong here, and I probably wouldn't think twice about it if it were just in-game gold - as I said, everyone makes these mistakes, you live and you learn. The thing that bugs me is that this currency is so close to effectively real money. It's possible that $20 worth of diamonds really matters to the person who made the error, because they don't have much money to spend on games. Back in the subscription days, everyone could be assumed to have the $15/month price of admission on hand, and capitalizing on someone's mistake for gold was not going to take away something that they paid money for. Should the mechanics of auction houses be different when there's sort-of money at stake? Or is it best to let people learn from their hard knocks? 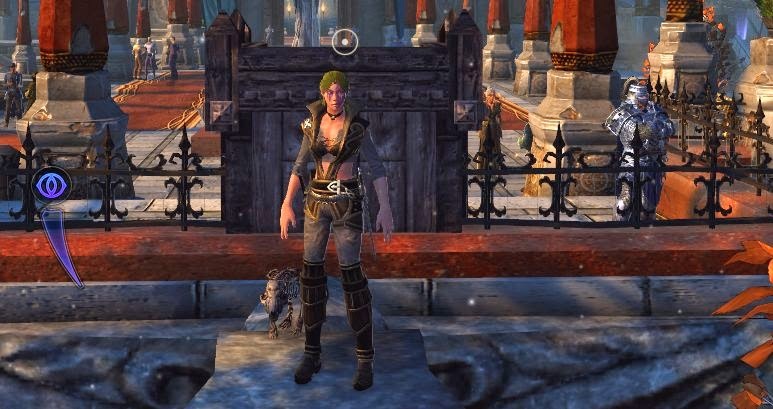 My Neverwinter character has advanced steadily through level 31, halfway to the game's level cap. If you're looking for a decent single player experience with little (though probably not zero) money down, the game seems to fit the bill. If you play MMO's because you are seeking to fill every gear slot on your character with a reasonable quality item, you're in for an expensive and frustrating haul. The question I can't quite answer yet is to what extent your stats matter. 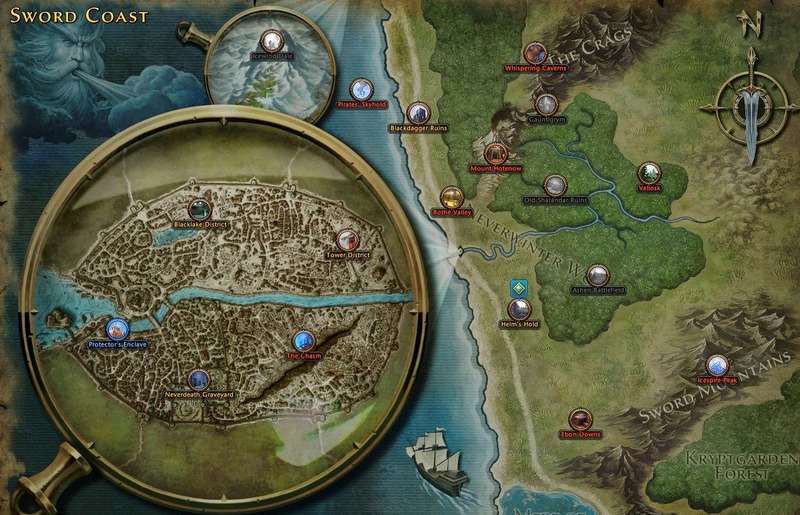 According to the game's map, I've seen fewer than half of the zones, though some of these areas may be dungeons and/or level 60 endgame areas. The game plays roughly like other recent MMO's, with click-to-attack, a requirement to play in mouse-look mode (which is clunky when it comes to actually using anything on the UI), and lots of dodge-rolling in response to red danger zones on the ground. One innovation on this point is that you are not actually required to get OUT of the red area - as long as you perform a dodge roll, the game will treat you as having dodged that attack, so you can get back to killing and don't need to worry about failing to travel far enough for whatever reason. (I guess this is technically consistent with Dungeons and Dragons rules, where making a saving throw against something does not necessarily physically move the character out of the way?) I don't generally play rogue type characters, but with all the rolling around that you have to do regardless and less penalty than normal for being caught in melee range, an agile character just feels right in this particular game. Mechanics aside, it's a reasonably high production value game with about the requisite quests, some voice acting and cut-scenes, and basic MMO features. I haven't had trouble soloing on the rogue with a healing NPC companion - more on this in a minute - and thus far I haven't hit major roadblocks. Things could go downhill but overall it seems like the game is not out to stop me from getting to the level cap. Almost all equipment has slots for enhancements. Refining enhancements (done by feeding them other unwanted enhancements and then using a consumable item that is not readily available without diamonds) is costly, and it's not clear that it's worthwhile; I'm finding rank 3-4 enhancements in loot now, so spending diamonds to upgrade my rank 1's would not have been a good plan. Each character can have one active NPC companion and 2-4 additional companions (the slots unlock with levels 30 and 60) for passive stat bonuses. In addition to costs to obtain the companions, these guys also have quality tiers that affect both the companion's rank cap and their passive bonuses. My top priority with my Diamonds was to obtain a healer NPC. Neverwinter characters don't have significant passive healing or food to heal up between combat, so either your character or your active companion just about has to be some kind of Cleric if you intend to solo. You receive a white quality Cleric for free at level 16, but this character is capped at rank 15 out of 30 due to its low quality; by most accounts, soloing at high levels will be unpleasant. I don't know if you absolutely need to go all the way to Purple quality and rank 30 (though each companion has a third special ability that requires this rank), but paradoxically the cost of upgrading that companion was actually significantly higher (300K for white to green, 500K for green to blue, and 750K for blue to purple) than just buying a purple healer from a past promotion (about 600K) and not having to worry about the problem. This solution costs around $12 depending on the current exchange rate, and I'd consider it a near must have. If I was paying out of pocket, I'm not sure what, if anything, I would buy. 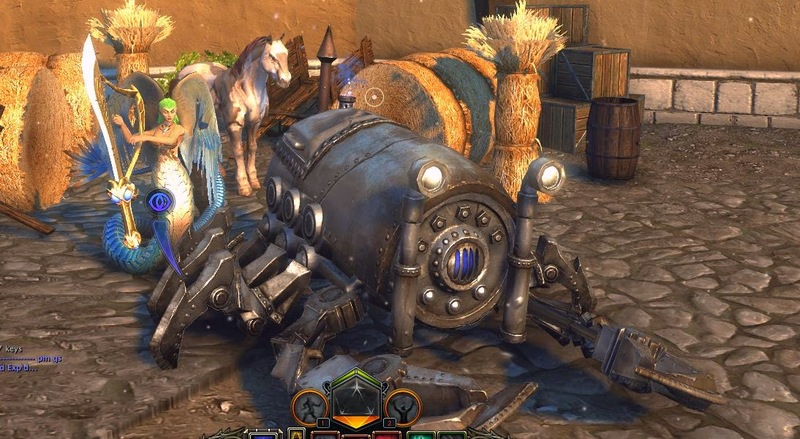 Since I didn't pay for my diamonds, I did spend a chunk on an upgraded mount, which moves twice as fast and can take significant more hits, in exchange for looking like a steampunk scorpion-mech. I spent my remaining diamonds on additional companions who offer passive bonuses I wanted to slot on my character for adventuring, while also providing a party of four companions to play the Sword Coast Adventures minigame on the web portal. There are fees for storage, though I haven't had issues here. There are fees for respecing, but I either didn't screw up my build that badly or else haven't done anything hard enough for it to matter. The real place where the cost will be problematic would be if the game gets to the point where it's hard to scrape together enough DPS with non-upgraded gear. Of course, I don't care about PVP or even dungeons, so it's easier for me to shrug this side of the game off. If you play MMO's to acquire gear, this system - bearing in mind that acquiring the currency naturally is not especially convenient to create demand for currency resales, could be a deal-breaker. A side effect to grabbing the cheapest purple quality healer and mount I could find is having a giant scorpion mech for a mount and a Lamia with a sword-harp for a companion. This tasteful stuff doesn't exactly fit the lore as far as I was aware, but at least it's not costing me anything out of pocket. A double exp weekend finally got me to try out Neverwinter a year into its run - I played a few hours in beta, had no particular problem with the game, and just didn't get back to it until now. I was a bit surprised to find that the business model appears to emphasize currency resale on a scale I would have associated more with an underwhelming Neal Stephenson book. By making the game's primary currency extremely inconvenient to farm, Cryptic has somehow carved out a niche where it puts non-payers to work farming currency to sell to people in exchange for cash store currency (which they pay Cryptic for in real money). There is gold in the game, looted from mobs and used to pay NPC's for some things (primarily common consumables), but notably is NOT the currency for the auction house. There is a cash store, with a currency called Zen (common name for all Perfect World games, though the actual funds cannot be transferred). This contains all the usual stuff - bags, mounts, outfits, etc. There are some places where the game mentions that you can buy stuff with Zen, but it's nowhere near as common as many other titles. There are the obligatory tokens used to barter for gear. These at least go into a currency tab as far as I can tell. The game includes the ubiquitous obnoxious item gambling lock boxes, which you have to manually destroy out of your inventory because they are the only item in the game that is automatically picked up upon walk-over (like gold). Like many other titles where these have a bad name, there is zero transparency about drop rates and a server wide spam message claiming that someone has won the top prizes, though I see many less of these than I do in other games. The game does NOT include an optional subscription, charges for content, etc. All of which brings us to Astral Diamonds. Diamonds are the currency for the auction house, and the majority things that you would expect to pay for in an MMO, including consumable components of crafting, tier upgrades for gear/mounts/companions, along with some free-to-play additions like instantly refreshing cooldowns in most mini-game systems. The primary source of diamonds are a variety of daily quests or other objectives. The currency is routinely looted in quantities of a few hundred or maybe a thousand, is routinely spent in the hundreds of thousands or even millions on the auction house, and can't really be farmed short of planning your entire life around logging in every hour to take advantage of every last event and cooldown that offers diamonds as a reward (which still has a hard cap of 24,000 diamonds per day). The only quick way to obtain more diamonds is to pay other players. It's an odd setup, but apparently players are more willing to tolerate this approach than having Cryptic cut out the middle man and sell the diamonds outright. There's a niche for the clever, a way to monetize players who are never paying a cent of their own money, and a way for the player who does not want to be bothered to solve the problem with their wallet. Clearly it's working for Cryptic well enough for the game to stay up and running. Whether this approach can fly in the long run with inflation is another matter.